Inconceivable Choices: Damned if You Do, Damned if You Don't. Now a clever man would put the poison into his own goblet, because he would know that only a great fool would reach for what he was given. I am not a great fool, so I can clearly not choose the wine in front of you. But you must have known I was not a great fool. You would have counted on it, so I can clearly not choose the wine in front of me. 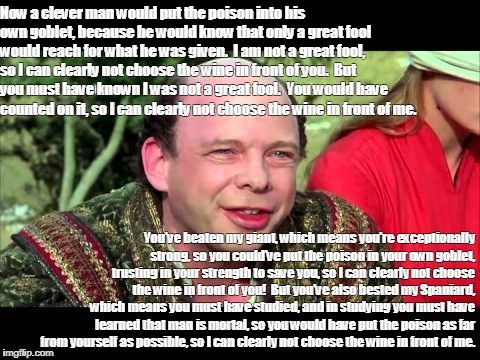 You've beaten my giant, which means you're exceptionally strong, so you could've put the poison in your own goblet, trusting in your strength to save you, so I can clearly not choose the wine in front of you! But you've also bested my Spaniard, which means you must have studied, and in studying you must have learned that man is mortal, so you would have put the poison as far from yourself as possible, so I can clearly not choose the wine in front of me.